Cost of delay is the difference in the value of doing something sooner vs. doing it later. The cost of delay of a new product development project is the amount of additional profit you would make by launching a product at an earlier time 'X' vs. launching at a later time 'Y'. It is the total profit-dollars lost per unit of time of delay, e.g., the total amount of dollars lost, per month, per week, or per day of delay. Although there are many different situations and scenarios for different types of projects and products, in most cases it is fairly easy to estimate this the cost of delay. 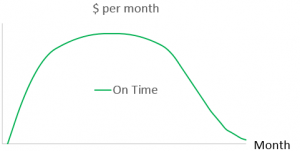 In the images below, the green curve represents the money we expect to make (per month) if we launch on time. The area under the curve is the total cumulative profit we expect to make over the entire time period. The forecast in the image above predicts sales for the complete product life-cycle. However it is unusual to predict sales for a full life-cycle for most hardware products. As an example, medical device life-cycles are often 5 to 10 years or longer, but revenue and profit goals are more short-term. As such, forecasts are only made for the first several years of the life-cycle. The product life-cycle curve is cut short, as in the graph below where sales rates do not decline. The numbers needed to build these profit curves are readily available as sales forecasts. They are typically developed early for a new product, and they can be combined with actual monthly sales volumes of similar products in the past. When combined, these figures give us a monthly forecast of projected profits. What happens to profit when we are late to market? Now let’s look at what happens to our profit when we are late to market. In the following images, the red or orange curve represents what happens if we are one month late. As you can see, the total amount of money made is reduced when we are late to market. The area between each curve is the difference in cumulative profit. For example the difference between the green and the orange curve or the difference between the green and red curve is the difference in cumulative profit. This is the Cost of Delay. See the next post in this series, where we learn how to quickly calculate the cost of delay of a product development project.